Q&A: Can you recommend a good, but affordable microphone for recording my podcasts? Question from Felicia: I have a blog that I’ve been posting on three times a week since November 2015. I’m really happy with the success I’m having with it and now I want to try my hand at podcasting to supplement the blog posts. Can you recommend a good podcast-quality microphone that’s affordable? I’m hoping to spend $100 or less but I’m willing to spend a little more than that if I have to in order to get a decent mic that’ll last for a good while. Rick’s answer: Felicia, I don’t record podcasts and I don’t have any recent experience with studio-quality microphones, but I did some checking around and found a mic that appears to be just what you’re looking for. The Blue Yeti Nano USB Microphone was released in the third quarter of 2018 and it has apparently already become quite popular with the podcasting community. And after reading the product description and user reviews on Amazon I can understand why. By all accounts this mic produces excellent quality sound, and it’s built to last. And at the time of this writing you can get one for about $100 which is right at your stated target price. The Blue Yeti Nano connects to your computer’s USB port and it’s 100% Plug-N-Play without any kind of extensive setup required. I could spend a lot of time boring you with the technical details of this mic, but you can easily read them for yourself along with the great user reviews at Amazon. You might also want to watch the short video review I found and posted below for an actual demonstration of the Blue Yeti Nano in action. Note: You can watch the video at full screen by clicking the “square” icon that will appear in the lower right-hand corner of the video after it starts playing. As you can see, this appears to be an outstanding microphone for the money. 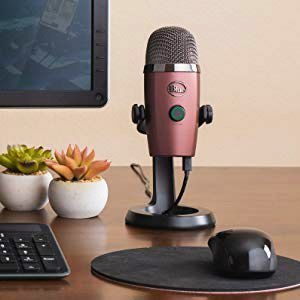 Bottom line: Based upon everything I’ve seen and read about the Blue Yeti Nano I believe it”ll make an excellent mic for recording your podcasts. Click here to check out the Blue Yeti Nano USB Microphone at Amazon, including dozens of overwhelmingly positive user reviews.